The 2018 golf tournament will be held at Grande Dunes Resort Golf Course, Sunday, June 24, 2018. Known not only for its superior links-style design, the Grande Dunes Resort Golf Course is an 18-hole golf course, with a spectacular layout. It was recently named the "National Golf Course of the Year" by the National Golf Course Owners Association of America. Prizes will be awarded for winning teams, including closest to the pin and longest drive competitions. Clubs are available on-site for rental. If you're bringing a guest they can also participate in the golf tournament. PFI offers individual registrations and team (foursome) registrations. *Club rental is self-pay and payable to the pro shop. Pre-Golf Lunch: A boxed lunch will be provided to all golfers at the hotel beginning at 10:30 a.m.
Transportation: A reserved shuttle will depart the hotel at 11:30 a.m. Tournament tee time is 1:00-1:30 p.m. If you do not take the shuttle, please arrive at the club no later than 12:30 p.m.; the course is a 15-minute drive from the hotel. There will be no shuttle service during play, and shuttles will return golfers to the hotel at the end of the tournament. Golf Clubs: If you are bringing your own clubs, there will be plenty of room on the shuttle to transport them. For those of you renting clubs, club rental is self-pay ($40) and payable to the pro shop. Attire: Standard golf attire is required (no jeans or cargo shorts; collared shirts please. Golf shorts will be allowed.). Golf shoes are recommended for safety. Be prepared for warm weather. Beverages: The MoistTech beverage cart will offer water, soft drinks, cider, and craft beer for your enjoyment. Prizes: After the tournament, awards will be presented during the Networking Reception. Prizes will be awarded for winning teams, including closest to the pin and longest drive competitions. Thank you to American Wood Fibers for providing the trophy. 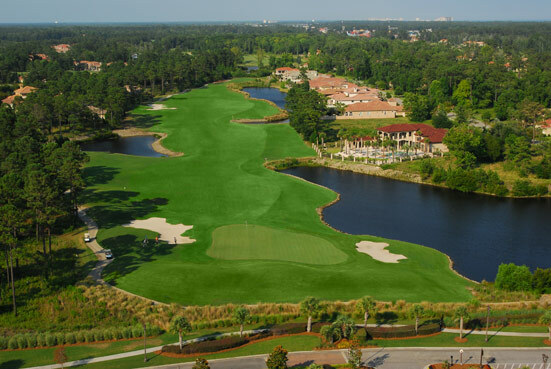 About the Course: Known not only for its superior links-style design, the Grande Dunes Resort Golf Course is an 18-hole golf course, with a spectacular layout. It was recently named the "National Golf Course of the Year" by the National Golf Course Owners Association of America.